Every year, usually in spring or fall, I spend a few days at Mohonk Mountain House, a hotel in the Shawangunk Mountains in upstate New York. With flags fluttering from its turrets and towers, Mohonk stands like a triumph of Victorian architecture, a hymn to nineteenth century beauty and civility. But I don’t go there for the luxurious setting, or even the amenities. I go to remember. 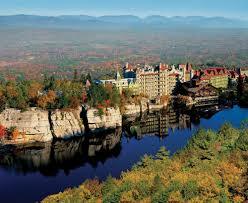 In the spring and early summer of 1972, when I was twenty-five, my first husband and I had summer jobs at Mohonk. I worked as a “flower girl” gathering lilacs and lavender from the cutting gardens, which I arranged into bouquets for the guests. It sounds idyllic, but that summer was more of a nightmare than an idyll. The truth is, I was having a nervous breakdown (to use an old-fashioned but aptly descriptive term). And though I would have loved to stay on at Mohonk that summer, to see the roses bloom and watch the cloud shadows flit across the mountains, I was tormented by an inner voice that prophesied all kinds of terrible evils, threw me in a panic, and rendered even existence malignant in the midst of unimaginable beauty and serenity. One of the reasons I have such affection for Mohonk, other than its beauty, I realized, is because I did have such a hard time there, and survived. 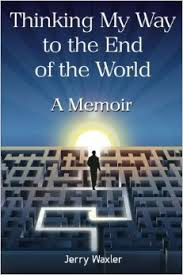 That got me thinking about why some chapters of our lives seem to arrange themselves (with a little editing) into a compelling narrative, while others do not, even though the events themselves may have been dramatic. Following is what I came up with – five elements of experience essential for building a story. A story requires conflict, and my summer at Mohonk was characterized by a titanic inner struggle between two opposing selves. These two conflicting selves tore me apart. I – or I should say, they – couldn’t even come to a consensus about whether I was really crazy, or just pretending to be. Ask yourself, what is the central conflict of your story? Is it an inner conflict or a conflict with another person, or both? How did you resolve it, or mediate between opposing forces? In my case, the strands of good and bad, dark and light, were so deeply intertwined in my inner antagonists that I couldn’t separate them without destroying myself. The only way forward to health and sanity was integration. That process of integration is unique to each of us, and it makes a riveting story in memoirs such as Girl Interrupted by Susanna Kaysen, Welcome to My Country by Lauren Slater, or Thinking My Way to the End of the World, by Jerry Waxler. One of the things that drew me back to my memoir when I was working on it, and kept my interest in writing it fresh, is the sharp contrast between the lush beauty of Mohonk that long-ago summer, and the gray prison-like starkness of my inner world. Contrast heightens interest and creates stunning story scenery. In a River Runs Through It, Norman Maclean illustrates the poignant contrast between the grace and gifts of his younger brother, Paul, and the ugly underworld Paul becomes entangled in. Kay Redfield Jamison’s An Unquiet Mind highlights the contrast between the destructiveness of the author’s manic depression and its seductive allure and dark beauty. First identify, then heighten and intensify contrasting elements in your story. There are many different forms or expressions of color. Even the absence of color paints a vivid picture. In the Mohonk chapters in my memoir, the language of my interior dialogue was colored by the highly charged political rhetoric of the times; my two selves were ideological as well as psychological enemies. Infuse your writing with vivid images and colors that draw you and the reader deeply into your narrative. Recollection truly is just that – re-collecting. You salvage the pieces of the past and arrange them into a pattern. As the pattern emerges, you begin to sense how to build the pieces into a narrative. Recollecting and rearranging is one of the most satisfying aspects of writing a memoir. Here is where it all comes together – the events of the past shaped by your present perspective, enriched by your vision and completed with the finishing touch – the wisdom you’ve gained from living and recreating the past.